My favorite bracelet maker is giving away one of her gorgeous beaded cuffs! You can choose from any in this section. Jessica's Serenity on etsy has so many great things, take a look around. I recently just got this and I love it! Leave me a comment below and tell me what cuff you would pick if you won. Make sure you leave your email address so I can contact you if you are the winner. They are all so wonderful but the Rustic country girl beaded cuff bracelet "Peachy-Pink and Sea Glass White" distressed brown leather, very country-boho caught my eye. It would be so hard to pick one. If I do have the honor of winning, I will pick then as I will have to drool over these for a few days. i love the cuff bracelets. They are so beautiful! they are very nice. so hard to choose in her etsy shop, they are all beautiful. would love to have one. Ohhhh how I LOVE these! I like all of them but the first one is my favorite. I would be thrilled to win one. So pretty. I think I would choose one of the surfer girl bracelets. You really can't go wrong with any choice. Happy Monday! Love these! I really like that lime green and turquoise one! Gorgeous bracelets. I liked the rustic country girl one - and so many more. I love the surfer girl bracelet. Actually I love all of them. I think they are all awesome, but my favorite is the Distressed brown leather single wrap cuff bracelet featuring czech glass beads in a clear almost diamond like down the center with charcoal gray czech glass seed beads stitched around the clear beads and purple glass seed beads stitched around the charcoal gray glass seed beads. A silver pewter button adds to the rustic chic vibe! I LOVE the diamonds and pearls bracelet!! Gorgeous! i like them all, but i think i would pick "Pink and Charcoal". Gorgeous, I love the surfer girl version. Any color would be fine! It is hard to choose.if I would be honoured to win anything from u I wish I get the second one from the top.with flower and white glass. Deciding on one is tough, they are all beautiful and would be super excited to win any. I think I really like the colors in the last one. I love the Surfer Girl cuff! Seriously?! Pick one? Way too hard...LOVE them all! The flower looks like a Dogwood which takes me back to home sweet home Kentucky. No dogwoods in Texas!!! Beautiful cuffs indeed!! The first one is awesome! love it! Gotta love an Illinois girl ! I love them all ~ it is a tie between Faith and gypsy girl. I could layer them together. Hi, I think I'd choose the 1st one, it would go perfectly with my new party dress! Be still my heart!!! LOVE the Peachy-Pink and Sea Glass White! Would go with everything! The turquoise one listed last caught my eye but they are all beautiful...so unique! Country girl coral and aqua. Love them and your new cross one!!!! I'm lovin the top one! Love the closure bead! I love the Surfer girl beaded cuff bracelet "Clear, Diamond Like and Aqua/Mint", Brown leather, very rustic-boho chic, bohemian, gypsy... SO cute! I think I would pick surfer girl, but I love them all! I love the 2nd one. They are all beautiful! These are so beautiful! My favourite is the Surfer girl beaded cuff bracelet in Aqua/Mint, Charcoal and Sea foam. Gorgeous! Gosh... what beautiful bracelets... I hate to be a copy catter but I love the Cross & Wings like you got. They are all beautiful! Thanks at the chance to win. It would be so hard to choose - I love them all. I'd probably go for the one with the olive-y green beads, but would be thrilled with any of them! I love them all, but I'd maybe pick the one with the olive-y green beads. These are all so beautiful and so hard to choose but I do love the Country girl beaded cuff "Aqua and White Sea Glass" bracelet. Thank you so much for the opportunity. They are all beautiful. I would enjoy wearing any of them ! But, if I had to choose I will pick.....Country girl beaded cuff bracelet "champagne luster beads and turquoise glass seed beads", brown leather, very rustic-boho chic. They are sooo beautiful! My favorite would be the green and turquoise beaded bracelet with the flower, love it! What a fabulous giveaway!!! Gorgeous bracelets and I love them all. 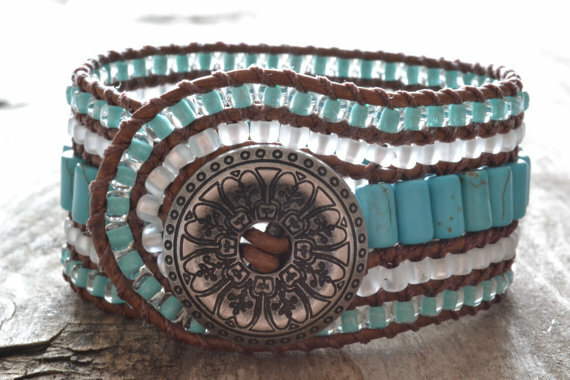 I think my favortie is the Rustic country girl beaded cuff bracelet "light aqua and pearl white" distressed brown leather. I would pick the Rustic country girl beaded bracelet. I just love the colors! Thanks for the chance to win. I like the one with the pink, turquoise and clear white beads. So hard to just pick one. They are all wonderful. I would have to think about this one if I am the lucky girl. I think I'd choose the Country Girl beaded cuff "white agate tube beads and aqua glass seed beads". They are all very pretty! Wow, I love these! I would get the one labeled "Country girl beaded cuff bracelet "white agate tube beads and aqua glass seed beads", gray leather, very rustic-boho chic"
I LOVE these bracelets!!! Saw them and instantly fell in love. Thanks for the fun offer. I love the Surfer Girl bracelet- so cute! I like these! And if I won, I'd love the 2nd bracelet! Turquoise is my weakness. Thanks for the opportunity! I would pick the white and teal (second from the top). Hard to choose but I think I would pick "Surfer girl beaded cuff bracelet "Aqua/Mint, Charcoal and white". Love it! I would want the same one you picked! gorgeous. I love the teal and white cuff with the flower! She is so creative! Beautiful bracelets! What an awesome giveaway! I love the Surfer girl beaded cuff bracelet "Sea green, Green and Turquoise", Brown leather, very rustic-boho chic, bohemian, gypsy. They are all gorgeous though! They are all so lovely! I guess if I HAD to pick ... it would be the surfer girl. Love the colors. They are beautiful. If I won I would love the last one.....the green/turquoise with the flower. I love them all but I think I would choose the surfer girl with green and turquoise. Pretty sure I'd choose the last one on this post, but I'll have to check out her Etsy site FOR SURE!!! So hard to choose, but I really adore the "rustic country girl!" What unique and beautiful cuffs!! I adore the turquoise and lime green one. I think that color combo is gorgeous. If I had the good fortune of winning, I would have to pick the Rustic Country Girl with diamond like features! What a tough decision, I just spent about 15 minutes searching them all and wondering...just imagine. They are all beautiful, but my favorite is the one with the champagne luster beads. Thanks for the chance! Beautiful bracelets! Would love this for Mothers Day! Tough choice... I'd either say surfer chic or rustic country! All are darling! I can't decide!! There are 2 that are my favorite! They are the Rustic country girl beaded cuff bracelet "diamonds and pearls, ....and the Country girl beaded cuff bracelet "white agate tube beads and aqua glass seed beads". I have admired these bracelets for quite awhile. Found them on Etsy. Have a couple of them on my wish list. I would choose the last one. They're ALL beautiful! But I especially love the acqu/mint, charcoal and sea foam bracelet...it would be lovely to win. Thank you! The bracelets are absolutely beautiful. I would choose the 2nd one if I were to be a winner of the giveaway. Very unique, haven't seen anything like it. Oh my goodness! I'm in love with the very first cuff! What a fabulous giveaway! They are all beautiful. I would choose the first one though. Thanks for the upportunity. so talented! i cant say how much i LOVE the Surfer girl beaded cuff bracelet "Aqua/Mint, Charcoal and white".. its the perfect mix of boho and chic and so eclectic. It would add to any outfit! Would love love love to get lucky and win this! They are all beautiful! The first one really caught my eye, but I'd be happy with any one of them. What a lovely giveaway! I adore the Country Girl turquoise and aqua bracelet. So pretty. I'd pick the third one with purple, gray & crystal beads. They're all gorgeous! Thanks for the chance to win one! Love the turquoise and white..so fresh for spring! Hard to choose but love the country girl coral and aqua cuff! Can't wait to read your fitness blog - check every day for it. Thanks for the chance and for your blog!!!! I love the turquoise with the white beads. They are all very beautiful. Thank you for such a wonderful giveaway. I love the agate long beads and aqua country girl plus I liked the pearl and crystal country girl cuff plus all four you photographed. I really like the surfer and cowgirl cuffs... So pretty and unique! The 2nd one! So cute! I'd pick the surfer girl in the mint colored beads - so pretty! I love them all, they are sooo pretty. My favorite is the second one. I love the detailed flower and the bead combination of color is lovely. I love the turquoise and white together. Ive been adding hints of turquoise to my home its time too add some to my jewelry collection! LOVE the Country Girl with the blue stones in the center! I am a bracelet nut - my favorite piece of jewelry! So hard just to pick one...but I would have to say the Country girl beaded cuff bracelet with the fleur de lis would fit with my rustic boho chic style. OMG, these are wonderfully, lovely!! I just love the essence of country and different... I am not one for buying jewelry from your everyday store, where everyone has the same one. I come from a small island where so many people are crafty and have beaded necklaces, not one like the other. I can't choose now (I want one of each! LOL), BUT, I definitely sway toward the blue beads with the all silver conch..... Thank you thank you for this awesome give away and showing us this awesome jewelry maker! Have a Blessed and Great Day!! Especially the first one....Would Love it for Mother's Day. They are all really cute! I would pick one of the Country Girl ones! The bottom one with the green and turquoise speaks to me. It tells me I'm fun and bohemian and what girl wouldn't like to feel like that!! I love the Surfer girl cuff in aqua and white sea glass. So cute!! I have to say I loved your cross and wings choice! But then I also stumbled across the orange beaded with elephant! Any elephant always catches my eye because my Mom collects elephants! Fantastic giveaway! Thanks for the chance! Hmmm...so hard to chose. They are all beautiful! but I'd pick the forth one. Thanks for the introduction - LOVE these bracelets! Hard to choose and even though I am landlocked, Surfer Girl in aqua / mint and charcoal and I would get along well I think. Thanks much! All the ones in her Etsy shop are just gorgeous! 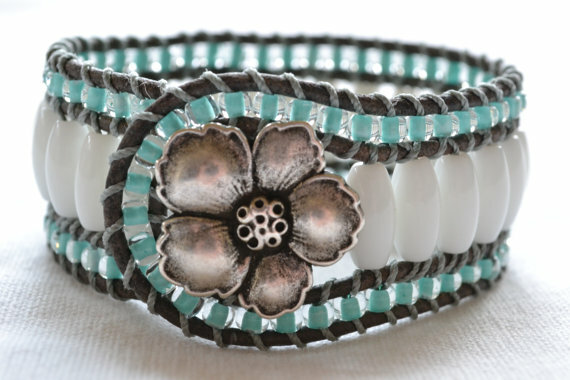 I would love the Rustic country girl beaded cuff bracelet if I won! Thanks for sharing! They are all so beautiful but the Country Girl beaded with white and aqua is what I would choose. Thanks so much. I love the Rustic Country Girl Cuff in blue-green, turquoise and green. Thank you for introducing us to this talented artist. AAAhhh....Country Girl! Although I work in the midst of suits in downtown Dallas, I could wear that every day!! These bracelets are amazing! So beautiful!! I would be thrilled to win any of them, but my favorite is the surfer girl in aqua and mint. Thanks so much for hosting the giveaway. I love your style! The last bracelet in your photo is the one for me. It's generous ! I love the color combo....I'll keep me fingers crossed for this one. Oh my what beautiful braclets. I love the surfer girls ones however, it would be a hard choice! They're all so pretty it's hard to decide, but I think I'd go with the coral and aqua. Love them all but I'd choose the bottom one with the olive green. I agree with Lisa- I'm anxiously awaiting your new fitness blog!!! love the one with green!! LOVE these bracelets! My pick would be the "Country girl beaded cuff bracelet, champagne luster beads and turquoise glass seed beads"....for sure! Thanks! Thank you for the giveaway. I love the rustic country girl bracelet. I love them all...but the 'Country Girl' beaded cuff is just speaking my name! Love the GYPSY SOUL in turquoise. SIMPLY STUNNING!!! These are beautiful! My fav would have to be Coral beaded, Brown leather triple wrap bracelet, Rustic Country, Gypsy, Boho chic, bohemian, Chan Luu style. Whoops! Forgot my email: [email protected] (I'm the above forgetful anonymous! What great work she does - I love the one you choose!! I think of the giveaway, my favorite is the peach/coral combo. It reminds me of the sunshine! these are gorgeous! I'd choose the country girl coral and aqua.. so pretty! Beautiful bracelets. I love the rustic country girl cuff...but, they are all great!! Love your blog!!!! I don't usually wear bracelets but would wear the lovely Rustic Country Girl! I love them all but I love the clear glass, silver flower and turqoise. Great giveaway! Love them all...if pressed will say surfer girl. Love your blog. The bracelets are to die for! Love them all but I especially like the last one, blue and green with the flower just says Spring! Thanks for the chance! I really love the surfer girl version! PS. I ended up going with Galveston Gray from Benjamin Moore on my walls LOVE IT. You need to stop by and check it out. Such beautiful jewelry and so hard to pick but the green, blue green and turquoise Surfer bracelet caught my eye! Thanks so much for the chance to win! Love them all! But if I had to pick my top fave it would be the country girl in aqua and White Sea glass! I just stumbled onto your blog, what beautiful things you share! 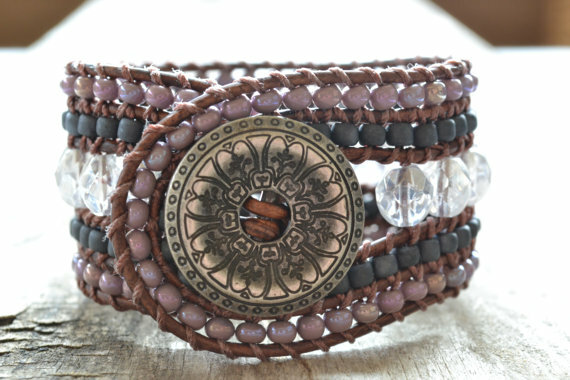 I would get the "Country girl beaded cuff bracelet "purple and pearl glass beads", distressed brown leather, fleur de lis, very rustic-boho chic" (whew, that's a mouthful!) this one: http://www.etsy.com/listing/113765967/country-girl-beaded-cuff-bracelet-purple?ref=shop_home_active because I'm originally from Quebec (the fluer-de-lis) and perhaps give it to my daughter, because purple is her favorite color. 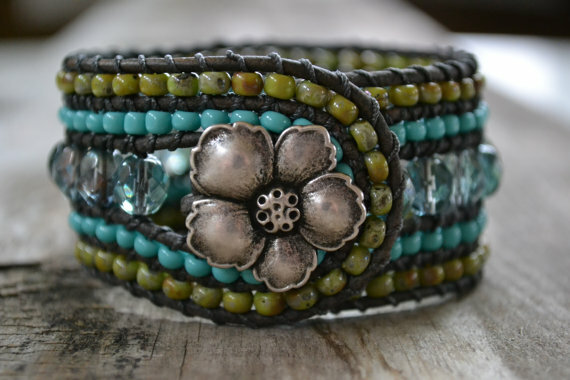 I love the Country Girl beaded cuff with the aqua glass seed beads and the gray leather. Thank you for the opportunity! I love these bracelets! I love them all but the last one is my favorite. love all but #3 is my pick!! Oh wow Melaine, what a fantastic giveaway!! I would choose the "Country girl beaded cuff bracelet "champagne luster beads and turquoise glass seed beads", brown leather, very rustic-boho chic". Love her designs, thanks for introducing her to us and for the opportunity!! Such pretty bracelets, currently my favorite is the Country Girl Turquoise & Purple with brown leather! I think I'd chose the second one, all that white makes it look so summery. My daughter-in-law would love this cuff. Thanks for the opportunity to get one for her. What amazing bracelets! I have never seen so many adorable ones and it is so hard to choose! The one with the lime green and turqoise is the one I would choose! Thanks for the chance. Rustic country girl cuff bracelet!